New Yorkers joined together over the weekend to help millions of their less fortunate neighbors. Robin Hood - New York's largest private poverty-fighter - announced today that combined VIP tickets sales and donations made via texts from Friday night's Black Eyed Peas concert in Central Park, donations on robinhood.org as well as ticket proceeds from Sting's 25th anniversary/60th birthday concert at the Beacon Theatre on Saturday night, raised more than $7 million to fight poverty in New York City. These funds will be earmarked to support food pantries, homeless shelters, health clinics and will provide jobs training for New Yorkers in need throughout the five boroughs. "This was an amazing weekend of music, and it's incredibly gratifying to see New Yorkers come together during difficult times to help their neighbors in need," said David Saltzman, executive director of Robin Hood. "The Black Eyed Peas and Sting have a long history of giving back to their communities and we're truly honored that they've chosen to help the 1.8 million New Yorkers living in poverty through Robin Hood; we hope to do them proud." Because Robin Hood's board of directors covers all administrative and fundraising costs, 100% of every dollar raised goes to helping individuals and families in need. On September 30, The Black Eyed Peas performed the largest charity concert ever held on the Great Lawn, with 60,000 in Central Park and thousands more watching live via web stream. Concert-goers participated in a variety of digital media efforts throughout -- including "text-to-donate", instagram, group-me and Twitter - to enter contests and enhance the sense of community and their enjoyment of the show. The "Concert 4 NYC" was presented by Chase, and was supported by Clear Channel's Elvis Duran and the Z100 Morning Show, Eventbrite and Calvin Klein Collection. As part of the partnership with The Black Eyed Peas, Robin Hood will fund the opening of three Peapod Academies in New York City over the coming years, which will support disadvantaged youth by providing music and artistic education, such as music engineering, sound mixing and video editing, among other opportunities. 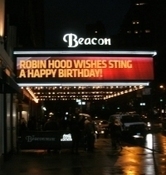 The following night - on October 1 - Sting generously donated proceeds from his all-star 25th anniversary/60th birthday concert at the Beacon Theatre to Robin Hood. Highlights of the show included incredible performances by Lady Gaga, Bruce Springsteen, will.i.am, Mary J. Blige, Stevie Wonder, Rufus Wainwright, and Billy Joel, among many others. In thanks for his many good works, prior to the show's kick-off, Mr. Saltzman presented Sting with a plaque naming the music room in the Robin Hood-funded KIPP NYC College Prep High School in his honor. The school is currently under construction in the South Bronx and due to be completed in late 2013. For more information about the Robin Hood Foundation and its mission to fight poverty in New York City, please visit robinhood.org. For more than 20 years, Robin Hood has fought poverty in New York City. It finds, funds and partners with programs that have proven to be an effective remedy to poverty and is a consistent force for good in the lives of New Yorkers in need. Robin Hood employs a rigorous system of metrics and third-party evaluation to ensure accountability from organizations that receive its' funds. The board pays all administrative and fundraising costs, so 100% of donations go directly to helping New Yorkers in need. It works closely with groups that receive grants to make them more effective, enabling them to assist even more people. In 2010, Robin Hood invested over $132 million in more than 200 programs and schools, directly touching the lives of over 650,000 New Yorkers. Warms the heart and moves a person to help and reach out in our own ways. nice one good toime was had by all too !!!! and the money kept local!!!!!!!!!!!!!!!!!!! Happy Birthday Sting! Today is the final day of the countdown...thank you to everyone who participated! In keeping with longstanding tradition of always being on stage to celebrate his birthday, Sting put on a stellar show at the Beacon Theatre in NYC last night. Joined by special guest performers Bruce Springsteen, Lady Gaga, Mary J. Blige, Stevie Wonder, Billy Joel, Will.i.am, Chris Botti, Herbie Hancock, Robert Downey Jr., Rufus Wainwright, Joe Sumner, and Branford Marsalis, the charitable concert raised millions for the Robin Hood Foundation.